I’ve been writing about TV for a long time. And I know what kind of viewer I am. A while back, I coined the phrase “rated ‘not for Amy.’” It was my way of delineating shows that I could appreciate were well done, but weren’t the type of show I’d enjoy. Game of Thrones, with its fake worlds (number one on the “rated ‘not for Amy’” hit list) and costumes that make it hard to tell the characters apart is a classic “not for Amy” show. As is The Walking Dead, with its gruesome gore and American Horror Story, with its fetish for the bizarre. These are shows I don’t volunteer to review. Not because I don’t want to be taken out of my comfort zone, but because I know I’ll sit down to watch them with a bias that I might not be able to overcome. On the other end of the spectrum are the shows that are 1,000% rated for Amy—your family comedies, your teen dramas, your medical dramas, your legal dramas, your shows that take place in the real world but with a fantastical or dystopian element (see Lost, Buffy the Vampire Slayer, and The Handmaid’s Tale). All of this is to say that I should adore The Marvelous Mrs. Maisel, which returned for its second season last week. It’s from the creators of The Gilmore Girls (a “rated for Amy” TV show if there ever was one) and co-stars Marin Hinkle (one of my favorite actresses dating back to her days on Once and Again). To the uninitiated, Midge Maisel (Rachel Brosnahan) is a 1950s housewife who must rebuild her life after being abandoned by her husband. A dark night of the soul leads her to a comedy club, where she discovers she has a natural knack for stand-up. She meets Susie (Alex Borstein, easily the show’s best character), who becomes her de facto manager. Like I said, I should love the show, but I really, really don’t. I spent yesterday (hate?) watching the first six episodes of the new season, trying to figure out why. 1. The performance style: The entire series has this “look kids, we are putting on a show!” vibe. Everyone is playing to the last row of a very big theater when we are all watching right in front of our TVs or computers. It makes none of the characters seem like real people. And it’s hard to watch a show where you know everyone is Acting with a capital A. In the fifth episode of the season, Shirley (Carline Aaron) and Moishe (Kevin Pollack) arrive at their Catskills resort and get out of the car. The whole thing is played for slapstick, which may work in theater but just seemed ridiculous here. 2. Child abandonment: If you read me often, you know this is an issue for me. Maybe it’s because I have two small kids of my own, but this is the one area of my TV watching in which I’m consistently unable to maintain the willing suspension of disbelief. Jack Bauer could get across L.A. in five minutes and never hit traffic and I was fine. Meredith Grey doesn’t have a car seat in her car and I go nuts. On Maisel, I could even get over how rarely we see the children and how no one ever seems to be worried that they are fed or cared for in any way. It’s that the children’s presence when Midge does think of them is a constant annoyance. We are supposed to root for her and like her, but how can we when she has so little regard for her own children? In one scene, Midge, her mother (Hinkle), and her father (Tony Shalhoub) all leave the house, leaving Midge’s son and infant daughter behind. “Someone’s got to stay,” her father exclaims with exasperation as they all march back into the house. In another, they arrive in the Catskills and leave the baby in the car for what seems like hours. It’s played for laughs, but I’m fairly certain leaving your baby in a sweltering car is a crime. 3. Midge’s lackadaisical approach to her career: The whole premise of the show is built on the idea that Midge wants to be a comedian. So, after having a successful night at a club where she took on all the male comedians who came before her, she takes off for the Catskills for two months. Her career is not as important as the bathing suit contest at the resort. And she only returns to New York when she gets offered to work at the Revlon counter at the department store. How are we supposed to take her career seriously when she doesn’t? 4. Joel and Midge as a couple: I think we are supposed to want Joel (Michael Zegen) and Midge to get back together. But Joel abandoned his wife and his children so he could have a fling. And Midge is extraordinarily self-centered. She ruins her friend’s wedding so she can tell a few jokes at her reception. Her mother is gone for days and she doesn’t notice. And I’ve already entered into evidence how little she cares about her children. 5. The Jewish stereotypes: Since the first season, the series has leaned into Jewish stereotypes so heavily, and in a way that is mocking and insulting, that it borders on anti-Semitic. Look at how Shirley hides money where she can’t remember! How hilarious that Midge’s sister in law, Astrid (Justine Lupe), is fasting! 6. It’s become an equal opportunity offender: Apparently, mocking the Jewish faith wasn’t enough. Not surprising for a show that kicked off its pilot episode with a fat joke, this season it’s also mocked Italians, Catholicism and infertility. Leaving no stone unturned, it’s also had a homophobic moment or two for good measure. When Joel and his friend Archie are in his room, Shirley walks in and says, “Never mind me. I saw nothing.” Not only is that wildly inconsistent with the times, it’s also just bizarre to infer that because Archie had his hand on Joel’s shoulder that something romantic was happening. I’m realizing I could go on and on. I haven’t even touched on the mocking of the art students who want to pursue careers in teaching. Or all the swearing, which just seems to be there because Amazon Prime allows it to be. I want to say something nice, so I’ll end by mentioning the fabulous costumes and how delightful it is to see Zachary Levi on TV again. Otherwise, The Marvelous Mrs. Maisel lost me from the start. 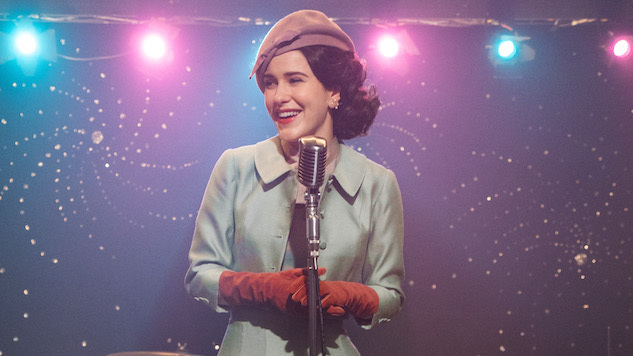 Season Two of The Marvelous Mrs. Maisel is now streaming on Amazon Prime Video.